Media portrayals of mental illness propagate prevailing myths and increase associated stigma. Mass media – TV, cinema and newspaper – are the primary source of mental health information for the general public. The mentally ill are usually shown in poor light; and images of unkempt, violent and dangerous men predominate. This greatly affects the public’s view of the mentally ill, causing them to fear, avoid or discriminate against people with mental illness. This is even true for TV programs and stories for children. From an early age mental illness is seen as less desirable than other illnesses. Negative images such as these affect those with mental illness, damaging their confidence and self-esteem. It makes them more isolated and withdrawn and they are more likely to stay away from therapy. In one study, as many as 50% of patients reported that a negative media portrayal had a negative impact on their illness, with 34% saying that it directly led to an increase in depression and anxiety. 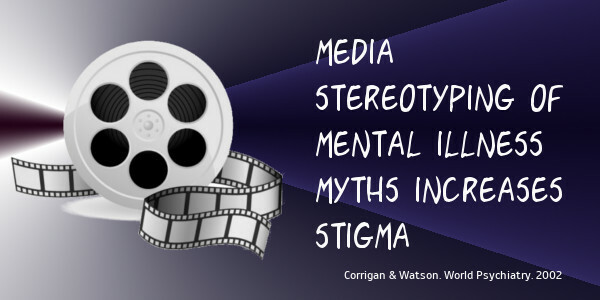 Government policies are also affected by prejudiced media portrayals of mental illness. Since people with mental illness are seen as anti-social, prone to violence and a potential danger to society, government policies tend to restrict and isolate instead of being more broad-based. Almost two-thirds of all stories about the mentally ill in both the news and entertainment media focus on violence. While it can happen, most violent crimes are in fact committed by people without mental illness. But a crime committed by a person with mental illness is blown out of proportion by the media instead of being seen as something rare and out of the ordinary. Studies in fact indicate that the mentally ill are more likely to be victims of violence rather than the offenders. The truth is that even severe psychiatric disorders can be treated effectively and people can lead normal lives at work, at home and in the community. While treatment of psychiatric disorders has evolved, the media continues to show outdated practices. This highly inaccurate portrayal often prevents both the mentally ill and their families from seeking treatment. The diagnosis and treatment of mental health disorders requires patience, skill and comprehensive evaluation. Mental health care professionals spend years in acquiring the qualifications and training required. Yet media portrayals undermine the integrity of these professionals. This further discourages people who are already hesitant to seek treatment. This encourages parents of teenagers to ignore symptoms as something that teenagers will outgrow. Movie portrayals of the teenager as a ‘rebellious free spirit’ further glamorises it in the eyes of the teen. 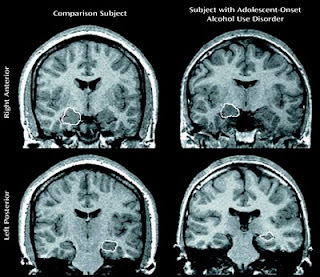 The truth is that the onset of many serious psychiatric illnesses is in adolescence or early adulthood and early treatment offers the best outcomes. While some people with mental illness are undoubtedly gifted, a vast majority of people with mental illness are ordinary individuals who want to get on with their lives and work productively. This caution is specially true for parents of children and adolescents; who view the role of the therapist as one who will unlock the hidden genius in their child. These unrealistic expectations put unnecessary pressure on children, often leading to a relapse; or a loss of faith in the treating clinician. Sympathetic but exaggerated media portrayals may do more harm than good. Simple achievements need to be highlighted just as much. As an example, while the media annually highlights the success of children with physical disabilities in the board exams, yet no story deals with the successes of those with children struggling against schizophrenia and other mental illnesses. Sharing such stories will increase awareness among the public about how regular treatment and supportive therapy can help a child return to normal functioning. The media’s defence is that the public is not interested in watching something dull and boring, and that they need to dramatize and exaggerate portrayals. However, authentic stories of mental illness have heartbreak, drama, humour and everything in between. Sensitive and accurate portrayals by the media will go a long way in removing the stigma and isolation associated with mental illness, bring the ill into the ambit of treatment, and improve their integration into society. This level of reporting can only be reached with considerable effort. We need to understand the media are geared towards sensationalism, and the facts regarding mental illness and the people affected by them are more nuanced. Murphy NA1, Fatoye F, Wibberley C. The changing face of newspaper representations of the mentally ill. J Ment Health. 2013 Jun;22(3):271-82. doi: 10.3109/09638237.2012.734660. Epub 2013 Jan 16. Patrick W Corrigan and Amy C Watson. Understanding the impact of stigma on people with mental illness. World Psychiatry. 2002 Feb; 1(1): 16–20.